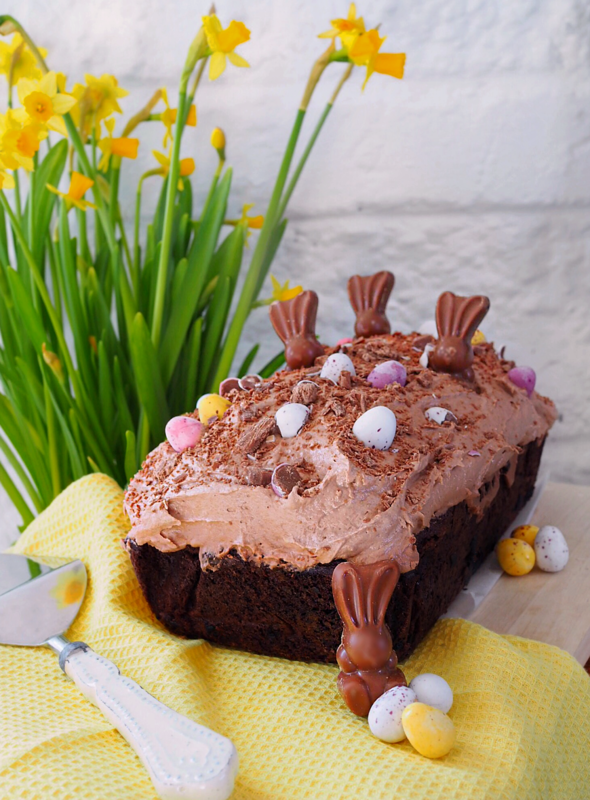 With only two weeks to go until Easter why not treat your family and guests to a special treat after your Easter brunch or holiday dinner with this cute hidden bunny chocolate cake. 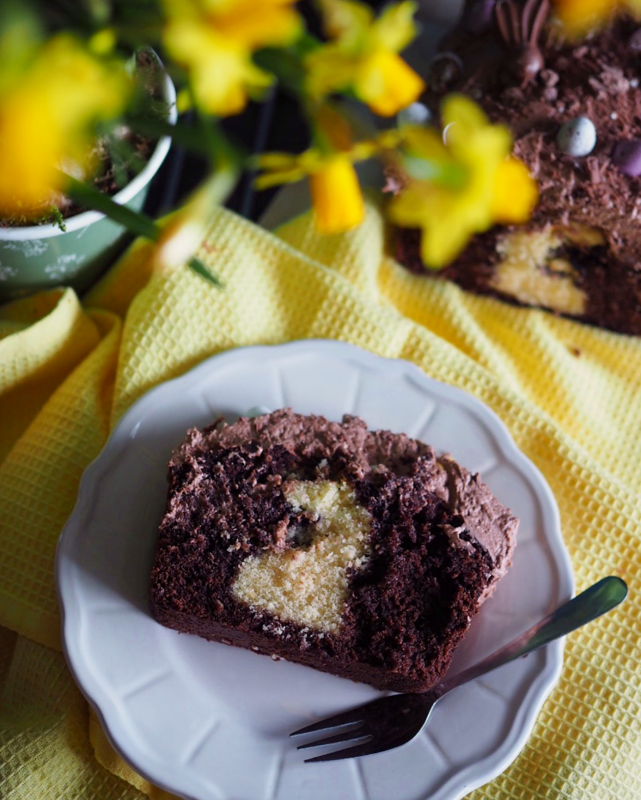 Slice into this delicious loaf cake and reveal the secret rabbit design running through the middle, it is the ultimate Easter centrepiece. My loved ones were hopping mad for it! 1. To begin with grease and line a 2lb loaf tin (x2 if you are making your own madeira cake) and pre heat your oven to 180°C or 160°C if you're using a fan-assisted oven. 2. Cream the butter and sugar into a large mixing bowl until pale and fluffy in texture. Add in the beaten eggs, one at a time, ensuring the mixture is combined well before adding the next one. If you start to see the mixture beginning to curdle, with your final egg add 1 tbsp of the flour. 3. Sieve the self-raising flour and gently fold in, with the milk, to ensure the cake mix retains as much air as possible to keep the final texture light and fluffy. The desired texture should be that it falls slowly from the spoon. 4. Spoon the batter into the prepared loaf tin and level out before placing in the oven. Bake the cake between 30-35 minutes or until golden brown, risen and just firm to the touch. Leave to cool for 15 minutes, then turn the cakes out to cool on a wire rack. 5. Cut the madeira sponge into 2cm slices and use the rabbit-shaped cutter to create the hidden bunny element to the cake. Once complete, place on a baking tray and put in the freezer to firm them up slightly. 6. To begin making the chocolate sponge, cream the butter and sugar into a large mixing bowl until pale and fluffy in texture, then gradually whisk in the eggs in the same way as we did with the madeira cake. 7. In a separate bowl combine the self-raising flour, baking powder, cocoa powder with a pinch of salt and mix together. Sieve the ingredients into your mixing bowl, with the milk, and gently fold together. 8. Into your prepared loaf tin, spread a third of the chocolate cake batter into the bottom and level out evenly. Remove your hidden bunny sponge pieces from the freezer and gently press down into the middle of the cake mixture in a smart line. It's important to leave a slight space at either end for the cake batter and also line the pieces up carefully so there are no gaps in between. 9. Spoon the remaining chocolate cake batter into the loaf tin, attempting to cover the madeira cake as much as possible. Bake the cake between 35-40 minutes or until firm to the touch. Leave the cake to cool in the tin. 10. Whilst the cake is cooling, to prepare the chocolate buttercream, beat the butter until soft and smooth adding the icing sugar one spoonful at the time until light and fluffy. Finally, add in the hazelnut spread until fully combined and for a silky smooth texture that allows a more spreadable consistency stir in the milk. 11. Spread the buttercream on to the top of your cooled cake and decorate with your chosen chocolate toppings. Once set grab a knife, cut into your servings and tuck in!